Company H, 18th U.S. Infantry. and Cabatuan offensive, Nov 1899. 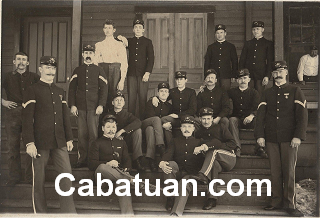 Garrisoned Cabatuan May 1900 to Sep 1901. When the Americans landed in Iloilo on February 11, 1899, the Estado Federal de Bisayas was immediately moved to Cabatuan, and it continued operating in this town until the Estado ceased to exist in September 1899. One of the historical errors circulating nowadays is that when Aguinaldo tried to abolish the Estado in April 1899 while in Cabatuan, it was again transferred, this time from place to place. "On April 27, 1899, Gen. Aguinaldo issued a decree abolishing the Federal Republic of the Visayas, which the Visayan leaders openly ignored since they were not under his authority. The embattled Republic continued to function, moving its capital from Sta. Barbara, Jaro, Cabatuan and other towns in the Province of Iloilo." Obviously, the last sentence is incorrect. The capital of the Estado Federal was not in Santa Barbara at that time. And there was no reason to transfer from Cabatuan, as well as from town to town, because neither the Estado's enemy (the Americans) nor the Estado's rival (Diokno's Tagalog forces) was attacking. The so-called "embattled" is merely a figment of the imagination, more applicable to Aguinaldo's government in Luzon than it was to the Estado Federal de Bisayas. The Americans were holed up in Iloilo City, Molo and Jaro. They knew that even if they attacked inland, their forces cannot hold the towns with their insufficient numbers. Besides, the 1st Tennessee Regiment was a volunteer unit, enlisted for a definite period of time, had to return to the U.S. soon, and must be replaced. So they waited for the replacement and additional troops before finally attacking in November 1899, by which time the Estado had already ceased to exist. The Americans were also aware of the Visayan-Tagalog rivalry. They figured that if they waited long enough, the Visayans and Tagalogs will go into open conflict with each other. This of course, did not materialize. The "Tagals" avoided open conflict, as was the case when Diokno's soldiers were killed by Cabatuan locals because of the abduction and abuse of their women. Diokno's troops opted to leave the area instead. Another reason why the transfer of the Estado Federal from Cabatuan did not happen was the next towns mentioned - Jaro and Santa Barbara. The Americans occupied Jaro after their landing in February 1899 and had been doing that since. On the other hand, Diokno's Tagalog Expeditionary Forces had their headquarters in Santa Barbara. It would therefore defy logic to be running away from the Americans and the Tagalogs and yet be doing the opposite, tranferring to where they were located, right into the jaws of the enemy or rival. The Estado Federal de Bisayas finally ceased to exist on September 23, 1899, right here in Cabatuan. Presidente Jovito Yusay and the Estado were replaced by Martin Delgado and his Politico-Military Government, still based in Cabatuan.